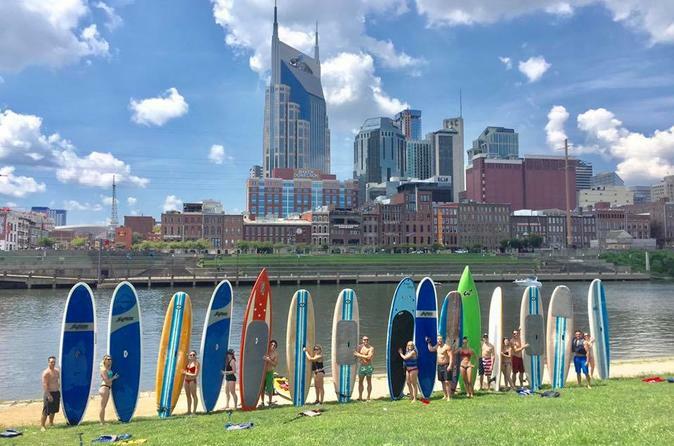 Enjoy a Downtown Nashville paddleboard tour, which consists of a 2-hour paddle down the Cumberland River that starts and ends at Riverfront park on Broadway smack dab in the middle of Downtown Nashville. Look out for our signature tour van (AKA the Willie Wagon) and it’s trailer full of paddle boards and gear. Meet the Willie Wagon and your experienced guide at Shelby Park in downtown Nashville located at South 20th Street. From here your guides will fit you with a life Jacket and all the equipment need for our Journey. We provide all the gear and a quick introduction session for new paddle boarders to make sure you are comfortable and ready for a nice calm ride. Then we launch and explore the Cumberland River on our 2-hour paddleboard tour with your group. This tour runs right past downtown for some incredible views of the city and buildings. The gentle current of the Cumberland River directs paddlers downtown, where paddlers enjoy some of the most unique sights and sounds of Music City, USA. The group will have a great time on the water and experience paddle boarding right smack dab in the heart of Nashville. When the tour is over, paddlers exit the water at Riverfront Park at Broadway and enjoy some photo opportunities, a quick beverage and snack before you are shuttled back to Shelby Park where we started.